A pickpocket was caught on camera using a pair of chopsticks to steal a woman's mobile phone as she rode down the street on her bicycle. The story was shown on the English website metro.co.uk on Thursday 4/11/2013. 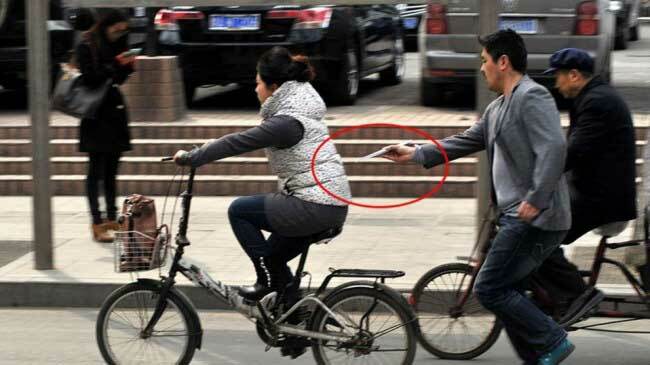 The thief, Wang Hongbo, 32, was caught on camera lifting the victim's cell phone from her pocket as she bicycled through Zhengzhou in China's Henan province. After stealing the phone he was also photographed examining the phone contents before selling the phone to a nearby store. The photos were posted online and widely circulated both on the internet and in print. Hongbo turned himself in to the police.